“Preparation is never wasted” that was a lesson from my youth and unlike a great deal from that era this particular phrase has stood the test of time. I am quite sure that it applies to pretty much everything but in fishing, where there are so many variables to start with, having “all your ducks in a row” becomes highly advantageous. On the competitive scene being sure that you have all that you need and that you have back-ups of the back-ups can be the difference between success and failure, perhaps not quite so much because of the items at hand but the lack of stress in knowing that you have done all you can to be ready. Generally for me that means having a check list when guiding, insuring that I have the client’s details, any specific food or health requirements, the correct location from whence to collect them in the morning and all that sort of thing. 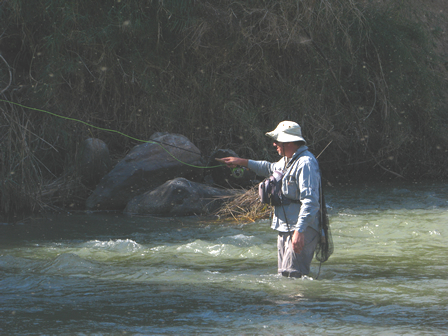 It isn’t just a question of rods, reels and lines. I should mention that most of these preparations have been born out of the crucible of abject failure at some point. I have in the past forgotten to take the net, forgotten to take the rods (which is even more problematic) and on one occasion forgotten in which hotel my client was residing, the latter a professional faux pas I wouldn’t care to repeat. So now there are lists and lists of lists, things don’t go in the box without being ticked off and they don’t get ticked off until they are in the box. Even then I went fishing last week without the net, although to be fair that was because, being a purely social trip to the stream, I didn’t check the list.. Live and learn. 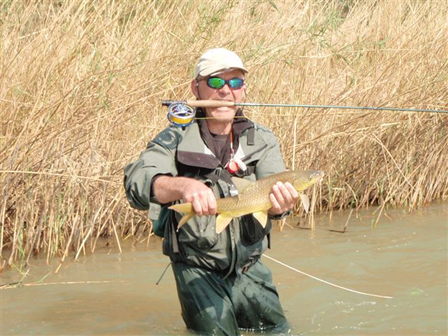 Mike Spinola braves the midges for some more fishing time. 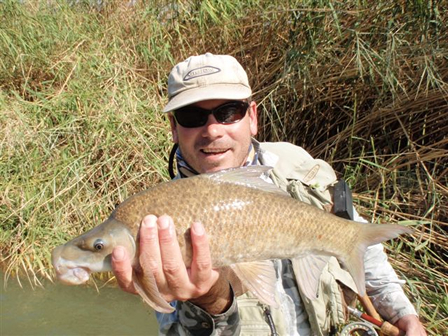 Right now I am in the midst of preparing for an extended camping trip on the Orange River with clients, where we intend to target the smallmouth and perhaps largemouth yellowfish. It is a remote spot, remote in the sense that there isn’t a shopping centre for miles, in fact there is, if you will excuse the expression, “Bugger all for miles and miles”. A mistake out there and you could be doing the “David Carradine, walk through the endless desert thing.” It’s all very well being well prepared in terms of the fishing tackle, but out in the desert, excepting within the narrow expanse of the river, a fly rod and waders probably come under the heading of the two most useless things that you may wish to have with you. and something in the region of 80 other items in various volumes all contained within 8 large boxes and two coolers, and that excludes any of the fishing gear. Of course, no matter how hard one tries something will be forgotten and you just hope that whatever it is won’t prove to be too critical. If one runs out of batteries for the headlamps then camp would be near intolerable, but if I forget the 5x tippet then we will have to make do with the 4x and it won’t be quite such a train smash. To add to the complexity we are on the cusp of spring and summer here, but the vagaries of the former season haven’t quite given way to the relative stability of the latter yet and climatic conditions are due to vary from 30°C heat to near freezing temps at different times during our stay. That makes packing all the more fraught, not to mention bulky if one doesn’t have a mind to keep things minimalistic. Of course the concept behind preparation is twofold: Firstly to allay one’s fears as far as possible and avoid that near inevitable “Packing paranoia” which will see one pulling off the road to check in a box at the back of the truck for some insignificant item you wonder if you packed. The second part of the process is supposedly at least to insure effectiveness whilst out there in the wide blue yonder. With some planning the amount of time spent fiddling about in camp is reduced and the amount of time left for actual fishing hopefully increased, that is at least the theory. 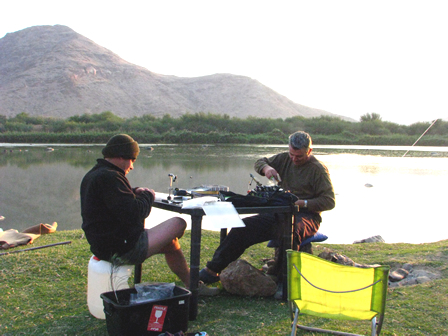 Flytying “Al Fresco”, remote camps are by necessity basic in nature. After all of this there is no guarantee that the fish will be cooperative, we have cast our plans, checked the weather and done the trip before at the same time of year, so disappointment shouldn’t rear its ugly head but it isn’t an impossibility, and that I suppose is the rub when it comes to fishing. The barometer could plummet, the flow rates could be high or non-existent and the water could be anything from crystal to chocolate. Those things you can’t foresee which is why one tries to cover all the bases under one’s control, to minimize the risk of failure. So there are boxes of flies, pre-manufactured leaders, indicators, braided loops. There are spare lines and spare reels, a spare pair of sunglasses, (and at my age spare reading glasses too). There are maps so we don’t get lost, permits so we don’t get arrested, sunblock so we don’t get burned, water so we don’t get dehydrated and at least a small amount of scotch so that we don’t go mad. 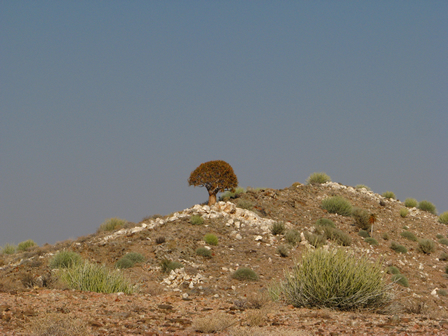 The desert: unforgiving but at the same time spectacularly pretty. Actually I am already questioning that last statement, we are going to all this trouble, driving for hours on both tarmac and dirt roads, burning goodness knows how much fuel so that we can eat sandy food and live in near darkness with a view to catching some fish which we have no intention of eating and for that matter aren’t really edible anyway. I suppose there is a fine dividing line between passion and insanity when you come to think of it, and we are all no doubt walking a tightrope on that front. Perhaps the best reflection of such a mission came from an indigenous resident alongside the river on a previous trip. 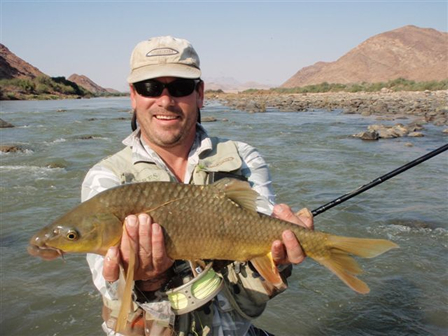 Having watched us all fly-cast from dawn to dusk for days on end, this itinerant, and relatively uneducated goatherd posed the following question: “Hoekom julle slaan de water so?”, translation.. “Why do you beat the water so?” Not a bad question really is it? Note: “The Fishing Gene Blog” has now seen over 50,000 views since its inception, not a lot by some standards but a milestone none the less, a milestone that motivated me to write this when I should be checking the lists and packing the boxes. Thanks to all those readers and followers who keep me at it..